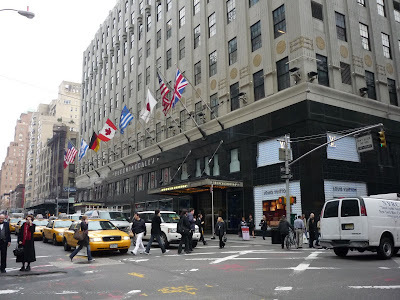 The series Flagships of New York: The Great Department Stores continues with a look at Bloomingdale's and Barneys New York. 1000 Third Avenue, 59th St. In 1861, the sons of entrepreneur Benjamin Bloomingdale, Joseph and Lyman, opened Bloomingdale's Hoopskirt and Ladies' Notions Shop on the Lower East Side. Ten years later, with the hoopskirt going out of style, they opened their East Side Bazaar, expanding the business to offer a wider variety of women's fashions. 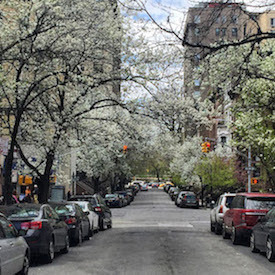 In 1886 the brothers moved uptown to 59th Street and Third avenue. In 1930 Bloomingdale's built the grand Art Deco building that houses the current store, an ambitious presence that commanded a full city block. The opening of the Lexington Avenue subway line in 1915 took shoppers directly to the store, and the company capitalized on this convenience with the advertising campaign "All Cars Transfer to Bloomingdales." Bloomingdale's features several places for hungry shoppers including Le Train Bleu, a fun dining experience in a replica of a French train car, on the 6th floor, 40 Carrots on the 7th floor (with a great frozen yogurt counter for a quick treat), and David Burke at Bloomingdale's on the 1st floor. Check out the store's in-store display of holiday decorations. A "We Love New York" Christmas tree is decorated with elaborate ornaments representing the city, including taxis, the subway, tourist busses, the skyline,and the New York Yankees logo. 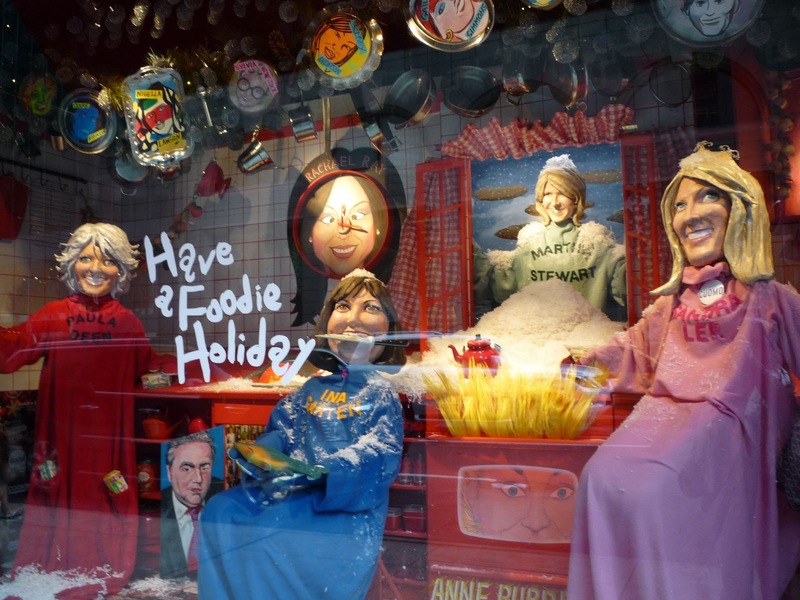 For this year's holiday window displays facing the street, Bloomingdale's went digital, moving away from the traditional mechanical and artisan windows of traditional displays. The windows are filled with flat screen displays showing images of winter landscapes. As a personal recommendation, the winter coat sale at Bloomingdale's is worth checking out for bargains on quality coats. The Lexington Avenue line (4,5.6) makes getting in and out of Bloomindale's very easy, especially convenient during rough weather conditions. In the 1920s, Barney Pressman pressed pants. That was while working in his father's store. Barney founded his own store on Seventh Avenue and W. 17th St. in Chelsea, specializing in boy's and men's clothing. The store became successful, so over time Barney added floors and acquired additional space across the street. His son Fred joined the business following World War II. The father and son decided to concentrate on quality menswear, as opposed to inexpensively made clothing. According to the company history on fundinguniverse.com, by 1973 the store "was stocking 60,000 suits and employing 232 tailors for alterations. "In 1976 the store introduced women's clothing. In the late 1980s Barney's America stores opened nationwide, and the company opened a store in the World Financial Center downtown. 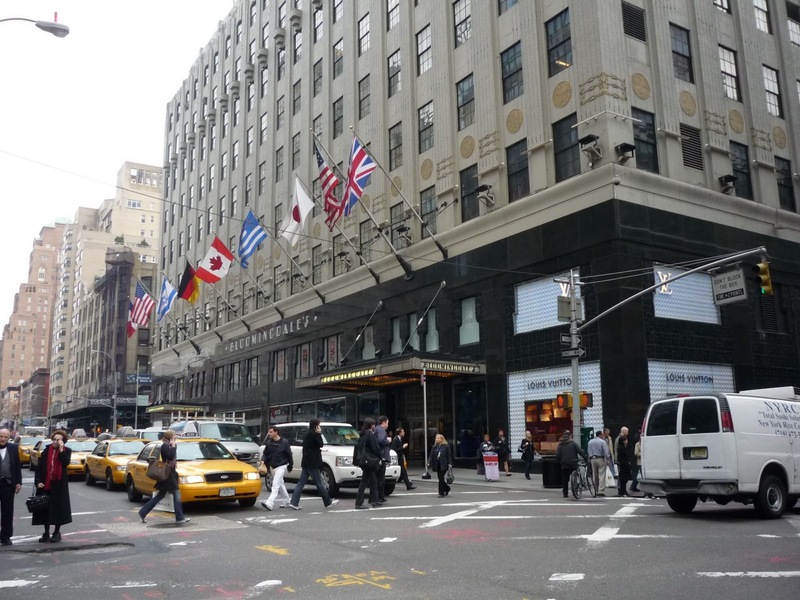 The present-day flagship for Barneys New York, an expensive and opulent store on Madison between 60th and 61st Streets, opened in 1993. A few years later, financing for the company's rapid expansion ran into trouble, leading to bankruptcy proceedings. The company did recover. The original Chelsea store closed in 1997. (The store's shell has been repurposed in a nice way by the Rubin Museum.) According to Hoovers, the company is currently owned by "an affiliate of Istithmar PJSC, an investment firm owned by the Dubai government." (source) Barneys New York operates several stores around the country, along with co-ops and outlets. Fred's at Barneys Madison Avenue is a full-service restaurant. 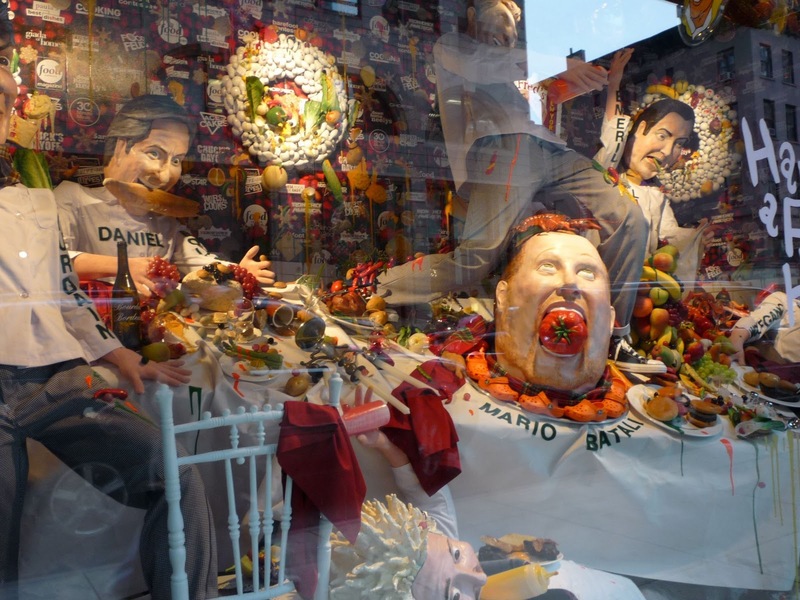 The holiday windows at the Barneys Madison Avenue store are usually among the most clever in the city. Remember, once upon a time Andy Warhol designed them. For 2010, designer Simon Doonan created a "foodie" theme featuring well-known celebrity chefs. Read an interview with him at the wnyc website. 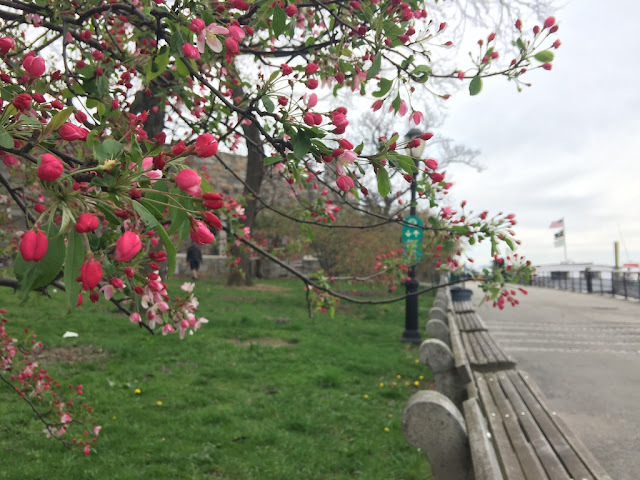 Images and video by Walking Off the Big Apple. 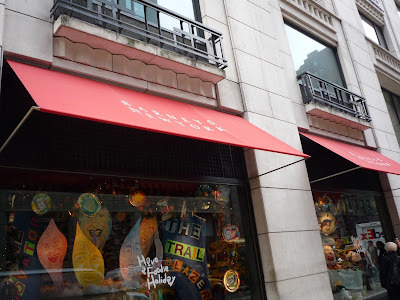 • A Self-Guided Holiday Walk to New York's Department Stores.